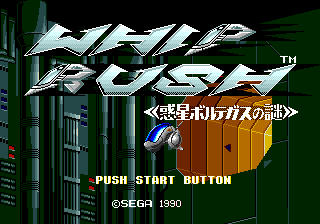 Whip Rush, called Whip Rush: Wakusei Voltegas no Nazo (ウィップラッシュ 惑星ボルテガスの謎) in Japan, is a 1990 shoot-'em-up developed by VIC Tokai for Sega for the Sega Mega Drive and released exclusively in Japan and the US. 2222 AD. The solar system as a whole has become overpopulated, and ships leave in search of new land. Five years later, still on their search, they disappear shortly after announcing their approach of the planet Voltegas (Voltegeus in the US version). Then, a massive alien craft appears near Mars approaching Earth and begins to attack. Fortunately, Whip Rush, a small ship, is ready to save the day. shoots (you have rapidfire, although at a limited rate). The game has no hard coded bullet limit, so using an autofire controller significantly reduces the difficulty as level. Holding allows you to adjust your speed; the current speed is shown in a meter at the top of the screen. moves the options around when not shooting, and lets them pulsate up and down/back and forth while shooting. Powerups are collected by shooting at capsules scattered around each level; getting hit makes you lose all powerups; getting hit again kills you. Main article: Whip Rush/Magazine articles.